It’s been a while since I’ve done any reviews so thought I throw some short notes out there – might become a regular thing, might not. Garth Ennis and Goran Sudzuka have got a fantastic horror story on the go here; the last six issues have been a well written tale of FBI agents on the hunt for a child killer and what happens after they catch him. 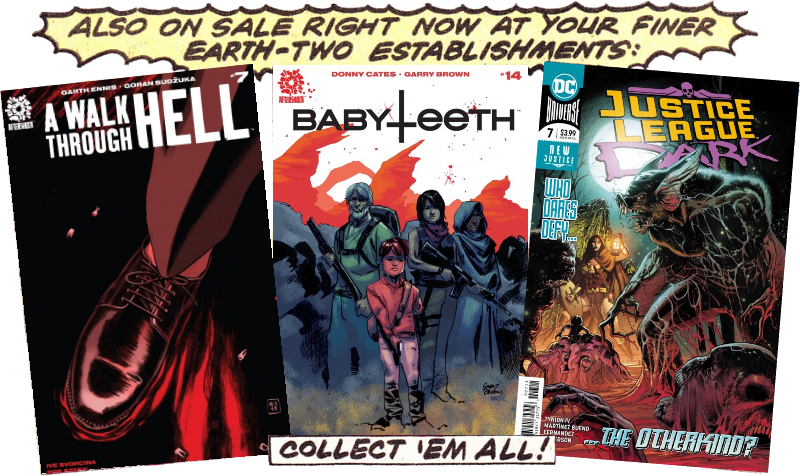 Each issue flips back and forth between the present and flashbacks, building up the story in stages, the horror of a child killer and the hunt for him in the past, the supernatural horror of what’s happened to the agents in the present. And in this issue, Ennis has gone Biblical in a very literal sense. Really recommend you pick this up. Sticking with Biblical horror, BABYTEETH is a tale of a young woman who’s given birth to the Antichrist and who is fighting to just raise him as normally as she can. And then of course a Devil worshipping cult led by her estranged mother gets involved, not to mention assassins and, in the last couple of issues, a trip to Hell itself where, here in #14, they meet Satan. As conversations about child support and absentee fathers go, this is a blast. In almost every issue of this series, just when you think you know where the story’s going, it throws something else at you. The tale of the other Ark during the Biblical flood, the one which didn’t hold Noah and all the fluffy animals, but instead held vampires and manticores and all manner of beasts and monsters. The rains have stopped, the monsters have landed and Shrae, the wizard who played the role of Noah to his weird cargo, has just one night for him and his family to enjoy themselves before the monsters turn on them. They are, after all, monsters. But then they’re all attacked, monster and human alike, by mysterious beings who slaughter some and capture others, forcing Shrae and the vampire Nex to team up. It’s good, but it’s starting to feel a little stretched, like it should be wrapping up rather than introducing another plot line. The hook on this new Hawkman series is that he’s been reincarnated throughout the centuries not just on Earth, but on other planets. This time round, Hawkman finds himself face to face with a previous incarnation on Krypton, just as the planet’s exploding. It’s a pause in the story of the recently (as in last issue) revealed Deathbringers, the race/army of killers that Hawkman led in his very first life; his constant resurrection cycle is to allow him to atone for the millions of deaths he and the Deathbringers caused. His Kryptonian counterpart gives him some advice just in time for the arrival of the Deathbringers on Earth’s moon. I enjoyed Robert Venditti’s work on GREEN LANTERN and I’m liking this take on Hawkman and the Bryan Hitch art is gorgeous as ever. This issue feels like it should have been out around Halloween – four short horror stories introduced by Man-Bat which feature members of the Justice League Dark coming up against manifestations of the Otherkind, the deeply horrid extra-dimensional beings that want to invade our reality and consume all the magic. JLD have been facing off against them since the start of this series and here we get the League as well as a handful of cameos – Frankenstein and the Creature Commandos working for SHADE, for example – fighting the Otherkind. This is probably my favourite Justice League book right now; not only is the writing really good, but the art is simply stunning, and this issue was a delight! Posted on Sunday, January 20, 2019 Saturday, April 20, 2019 by GaryPosted in Sunday ReviewsTagged Frankenstein, Hawkman (Carter Hall), Justice League Dark.